The Golden Princess spends Australia’s summer months cruising the azure waters of the South Pacific, and our winters exploring Alaska’s icy seas. Departing from Australia, the Golden Princess predominantly leaves from Melbourne or Sydney (however she does have a smattering of cruises departing from Brisbane and Adelaide) to the South Pacific Islands, New Zealand, or to Tasmania and South Australia. Looking for a taster cruise? 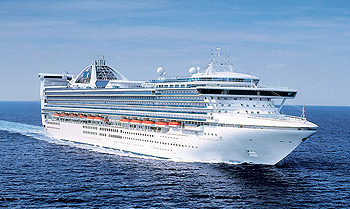 Enjoy the Golden Princess experience with one of her short 3 or 4 night coastal cruises. In Alaska, the Golden Princess operates 7-night one-way cruises usually between Vancouver and Anchorage (and vice versa), with potential highlights including picturesque Ketchikan, exciting Juneau and unforgettable Glacier Bay. Golden Princess is now an Ocean Medallion Class ship. Ocean Medallion is the portal to amazing possibilities. It’s the size of a quarter and can be worn in a variety of ways: as a wristband, pendant, clip or even in your pocket. Your Ocean Medallion then becomes your key to opening doors: to your stateroom, to your onboard account, to your ship and to experiences you won’t find anywhere else. View all Golden Princess cruises, view a selection of Princess cruise deals, or view more options for Princess cruises. An inviting world of wonder awaits your arrival on Golden Princess. Enjoy world-class cuisine, an abundance of onboard activities and entertainment to amuse your senses both day and night. From casino gaming to relaxing options like the Lotus Spa, you’ll find an array of ways to renew body and soul. Throughout your cruise, whether you love activity or crave tranquility, Princess Cruises offers everything you could need for a relaxed, rejuvenating retreat, including a wide variety of freshly prepared cuisine and innovative experiences all designed to help you escape completely. On every Princess Cruises ship, you’ll find so many ways to play, day or night. Explore The Shops of Princess, celebrate cultures at our Festivals of the World or learn a new talent – our onboard activities will keep you engaged every moment of your cruise vacation. Our exclusive partnership with Discovery Communications lets you come back captivated with Stargazing on our top deck; activities featuring DiscoveryTM hit shows such as Shark Week and Finding Bigfoot; plus our new Encounters with Discovery at SEA speaker series. Get more out of your travels with shore excursions recommended by two of the most trusted names in world travel- Discovery and Animal Planet. A perennial Princess passenger favorite, Prego serves up freshly made Neopolitan-style pizza by the slice or by the whole pie. Named the “Best Pizza at Sea” by USA TODAY, you’ll savor classic favorites made with hand-tossed dough, fresh tomato sauce, cheeses and pepperoni or try the daily specials. Relax, unwind and enjoy the endless variety of world-class entertainers such as live bands, comedians, illusionists and musicians performing on the large stage, as well as instructor-led classes and line dances. Seating over 300 people, the Vista Show Lounge’s warm and inviting intimate setting is perfect for quality time with family and friends over a cup of tea or learning a new talent with new friends that you’ve made on board.